The 2018-19 Brand & Reputation charity is the incredible Graham Wylie Foundation which supports children in the North East in so many ways – from the Children’s Heart Unit to the Teenage Cancer Trust, from Music Therapy for children with special needs to supporting local schools and education projects – and everything in-between. 100% of all funds raised go directly to supporting the children thanks to the incredible generosity of the founder, Graham, who funds all of the charity’s costs from his own pocket. We’re donating 5% of our annual pre-tax profits this year and Michael also ran the 2018 Great North Run, raising an additional £1,000+ to support the charity. 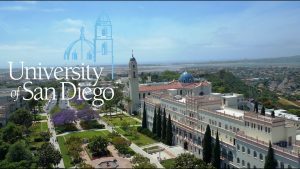 An inspiring set of meetings and a clifftop garden dinner at the University of San Diego, California was a memorable highlight from a month of conversations with clients’ stakeholders in Shanghai, Dubai, Boston, Madrid and London exploring brand positioning, finding your voice and building affinity. A conclusion of the really fulfilling governance and brand project with the North of England Children’s Cancer Research charity and visits to the University of Edinburgh and the University of Glasgow to discuss new challenges ensured another full diary. As another UCL project is concluded to great acclaim, a new UCL project emerges working with the Advancement team at this world-class university in the world’s greatest city. More time working from our London base and meetings with some of the most eminent and influential research academics on earth. In terms of partnerships, an exciting new link-up with award-winning Chicago-based creative agency Lipman Hearne, which specialises in working with not-for-profit organisations across the US, Canada and around the world, is set to further enhance our international profile and client base in 2019. A great start to the year with another consultation and narrative development project with UCL (this time around a new mental health strategy), the start of a programme of senior staff consultations at the University of Nottingham as part of the next phase of our ‘StudentsFirst’ work in partnership with Communications Management, and preparing a final report on the brand and governance consultations for NECCR. New business planning has also lead to some exciting conversations with the NHS, University of Manchester and Costa coffee at the start of what promised to be an exciting year. Meanwhile, Michael’s advisory work with the House of Lords continues this month too, alongside non-exec support for charities CASE and Tees Valley Arts. As we reach the end of a fantastic year, December has been yet another month of working with just the most inspirational clients. And closer to home, in more ways that one, a programme of stakeholder consultations and brand development with The North of England Children’s Cancer Research (NECCR) charity and its partners: Newcastle NHS and Newcastle University – has been a timely reminder of the incredible work of clinicians, researchers and fundraisers – and the incomprehensible bravery of children with cancer and their families – as we all look ahead to a joyous Christmas with our own families. N is for November – and for Nottingham – with the start of a major student engagement project for The University of Nottingham and a business assurance and review programme of Nottingham Trent University‘s marketing and communications operations – both delivered in partnership with Communications Management. At the start of the month Michael worked as part of a Halpin team to complete an exciting messaging and ‘case for support’ project for an ambitious fundraising campaign for Cancer Research UK, The Christie NHS Trust, and The University of Manchester. Client meetings and trustee commitments this month include travel to Brussels, Washington DC, London, Bristol and Swansea. The arrival of the unprecedented spell of warm weather brought with it a flurry of diverse short projects for new clients including The University of Manchester, Aluminati and The Courtauld Institute of Art – and as a partner associate for consultancy projects with Nottingham Trent and London South Bank universities (with Communications Management) and Swansea University and The University for the Creative Arts (UCA) (with Halpin). From designing and leading a MarComms management workshop to a comprehensive brand audit and competitor review to developing a new campaign narrative and case for support for a multi-million pound capital development vision, the Brand & Reputation service has been in high-demand and has clocked up the miles with work in Manchester, Newmarket, London, Surrey, Nottingham, Swansea, Edinburgh and New York. 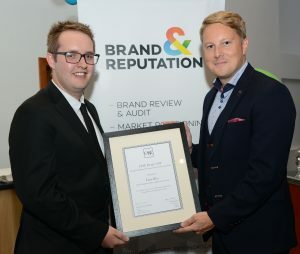 Brand & Reputation was proud to be the inaugural sponsor of the ‘Emerging Marketing & Communications Professional Award’ at the 2018 CASE Europe Awards. 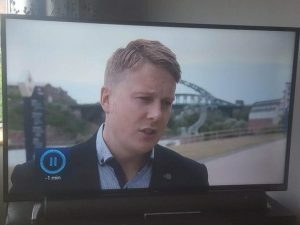 Brand & Reputation CEO Michael featured on ITV regional news ahead of his appearance as part of an expert panel at a leadership lecture and Q&A event at the University of Sunderland to explore the development of a cultural brand for the city on the back of its bid to be the UK City of Culture for 2021. Two big projects were completed this Spring with positive feedback forthcoming from both clients. Nothing makes us happier than satisfied clients!